Newborn jaundice, or the appearance of a yellow color on your baby’s skin early in life, is virtually universal. Yet for many parents it can be deeply upsetting, even scary. For the vast majority of babies, jaundice — caused by a pigment called bilirubin released with red blood cells break down naturally — is a normal process. In a tiny minority, untreated high levels of jaundice can be dangerous by causing damage to organs such as the brain. Hemoglobin is the molecule inside every red cell that holds oxygen as it’s carried via the blood to tissue. Red cells of older children and adults last 120 days, while those of newborns last just 100 days. Newborns also have considerably more red cells. The combination of more cells lasting fewer days means that lots of bilirubin is produced as the hemoglobin from the dead red cells is converted in a newborn’s liver to bilirubin. The liver then excretes the bilirubin into the newborn’s small bowel. This is where things get interesting: In order for the baby to, literally, poop out the waste bilirubin, it must be bound to a fat molecule. And where does the fat come from? Breast milk or formula! It is a fact that breast fed babies tend to have slightly higher levels of bilirubin, because a mother’s breast milk, especially if this is her first pregnancy, takes a day or so to start coming in while a bottle fed baby will drink a fair amount of fat in formula from the start. So jaundice is a result of over-supply of dead red cells or under-clearance of the bilirubin. First, over-supply: Very rarely newborns are born with too many red cells. Much more commonly there is a blood group difference between the mother and her baby, either ABO, or Rh. (Things get complicated in a hurry, so if you want to know more, see my friend Wikipedia.) Regardless of the type of incompatibility, the result is production of maternal antibodies, which cross the placenta and attack the baby’s red cells. This shortens the lifespan of those red cells from 100 days to say 90 days, causing more bilirubin release! Second, under-clearance: the most common cause of under-clearance of bilirubin is an under-feeding infant. This is more common in first-time moms whose milk supply takes longer to develop. But it can also occur if parents forget to awaken a bottle fed baby frequently at night, for example. How do we make sure your baby doesn’t develop excessive bilirubin? First, typically on the second day of life, most hospitals measure the baby’s bilirubin using a non-invasive technique called transcutaneous bilirubin (TCB). Though not as accurate as a serum bilirubin (a blood draw), it doesn’t require your baby’s blood so it can easily be done even several times a day without trauma! 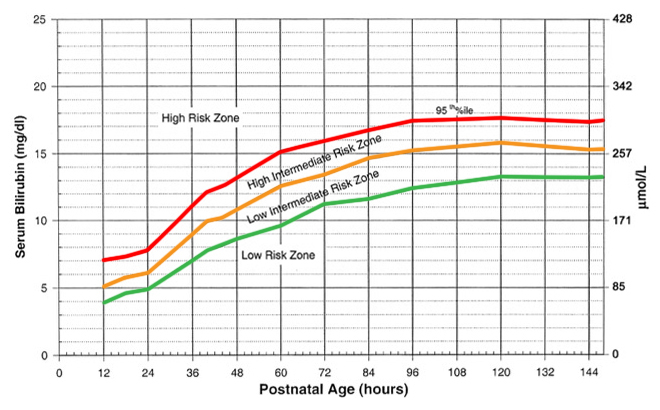 The TCB is then plotted against the age of your baby in hours on a graph (see below) indicating level of risk: low risk, low-intermediate, high-intermediate, and high risk. If the TCB is high risk, then blood from the baby is obtained to determine the more accurate serum bilirubin. The baby’s bilirubin rises naturally over time. Before birth, the mother’s liver was processing that bilirubin transported across the placenta. This was more efficient than the baby could do on his or her own. The bilirubin is measured in units call milligrams per deciliter, mg/dl. To illustrate the natural rise of bilirubin, a bilirubin of 10 mg/dl at 24 hours of age is High, almost enough to warrant treatment. But that same bilirubin just 24 hours later is Low Intermediate, and at 72 hours is so low it’s considered normal! So just as normal, acceptable levels of bilirubin rise over the first week, the level at which treatment is required rises as well. The approach to treatment of elevated bilirubin has become marvelously standardized, as the entire country now uses the same decision-making tool, called, appropriately, BiliTool. This online app allows a provider to put in the age in hours of the baby and the level of bilirubin, and then the app provides the threshold bilirubin at which treatment should be started. That threshold is lowest for high-risk babies, such as very premature infants, slightly higher for medium risk (ill infants or somewhat premature), and highest for a healthy full-term baby. So at 72 hours of age, a high-risk infant would be treated with a bilirubin of 13.6, but a medium risk baby wouldn’t be treated until a bilirubin of 15.5, or at 17.7 for a low-risk baby. Very specific wavelengths of light reshape the bilirubin molecule so that it becomes water-soluble, and can be cleared via the urine through the kidneys. Usually, the bilirubin will drop fairly rapidly under phototherapy so that the vast majority of babies admitted to the hospital for phototherapy can be discharged the next day. In the past, we rechecked the bilirubin in the office the day after discharge. With the newer, efficient phototherapy devices, we will usually check the baby’s color and weight the next day, but don’t always need to draw blood to recheck the bilirubin. You may have heard about home phototherapy units, which save the family the cost and burden of hospitalization. Multiple studies have shown that these units do not deliver sufficient light energy to effectively lower the bilirubin. Accordingly, providers at the Salem Pediatric Clinic discontinued use of these devices about 10 years ago. Given the emotional trauma as well as financial burden of hospital phototherapy, every effort is made to avoid a bilirubin requiring phototherapy. Given that the key to the baby efficiently clearing the bilirubin from his blood is sufficient fat from feedings, the baby’s weight is closely monitored over the first week to make sure he’s feeding enough to only lose the expected 7-8% of bodyweight by day 3 or 4, then starting to gain about an ounce a day thereafter. Put somewhat simply and generally, the bilirubin trends up as the baby’s weight trends down. Therefore, getting the baby to consistently gain weight reduces — but does not always eliminate — the need for phototherapy. I mentioned at the outset how upsetting a high bilirubin requiring phototherapy can be. For many parents, a completely unwarranted sense of guilt is their first reaction, as though something they did or didn’t do is responsible for the high level. Please, please don’t go there. Parents and providers work as a team to make every effort to avoid a bilirubin requiring treatment, but circumstances beyond one’s control (premature birth, a mother whose milk is simply slow to come in, etc) may intervene. And with modern therapy, the outcome is virtually always a happy one, with the bilirubin fading into the sunset over a few days. 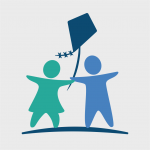 I wish to thank my close friend and colleague Dr. Suzanne Bailey for the many editorial suggestions she made to simplify and clarify this discussion of a complex topic.